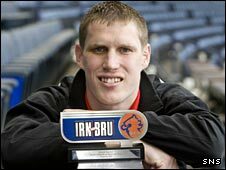 Derek Gaston of Albion Rovers is the Irn-Bru Phenomenal player of the month for September. The goalkeeper has let in just one goal in his last six outings as the Coatbridge side climbed to the top of Division Three. The 22-year-old was signed from Baillieston Under-21s in the summer and his excellent form is keeping Jamie Ewings out of the team. Rovers remain unbeaten on league duty, with only three goals conceded so far. The Irn-Bru award is for the best performer during September in the three divisions of the Scottish Football League.